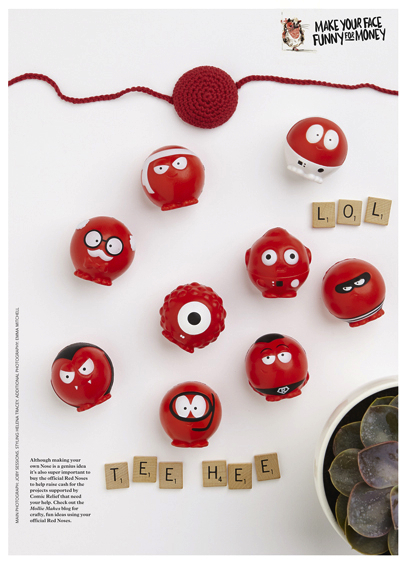 The Big Comic Relief Crafternoon magazine is choc full of brilliant patterns and tutorials for this season’s must-haves including knitted beards, floral moustaches, exquisite knickers, a messenger bag you can make from vintage pillowcases, wristwarmers and…… my little contribution! If I show you this sneaky preview, can you guess which is my design? That’s right! I made a pattern for a crocheted red nose so you can make one of your very own! When I was asked to do this by Emma Mitchell, a tireless supporter of the handmade and unique (and a laugh a minute to boot), I had no idea it would be part of such a massive production. Still, the apprehension that I feel that I’m about to be found out, is nearly entirely outweighed by how proud I am to be included, and for my pattern to be the actual red nose itself! 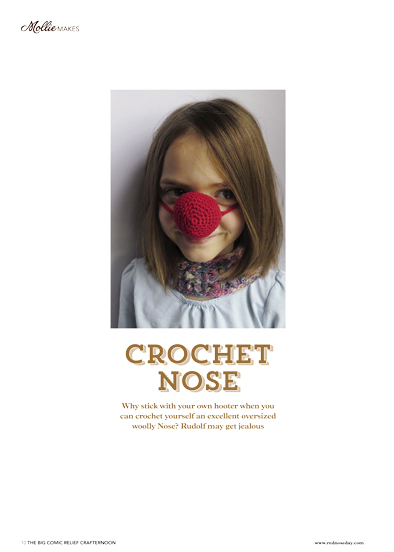 The idea behind this marvellous magazine is for everyone to get creating – whether it be crocheted red noses, felt guinea pigs, spring posy brooches or those floral moustaches – and then to sell all the handmade goodies to make more crafty cash for Comic Relief. The magazine even includes a guide to running your own craft fair – what larks! 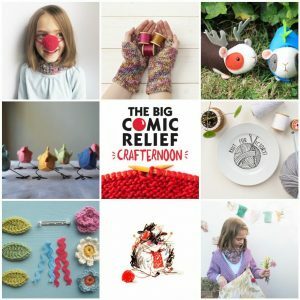 The Big Comic Relief Crafternoon will be on sale in Sainsbury’s stores and other locations nationwide next Thursday 29th January. It will also be available to download on iTunes/Google Play. It will cost £7.99 with a whole £5 going to Comic Relief to support their wonderful projects in the UK and Africa. Even I’m going to buy one, and it must be over 15 years since I last bought a magazine. Apart from Octonaut Magazine, obviously. 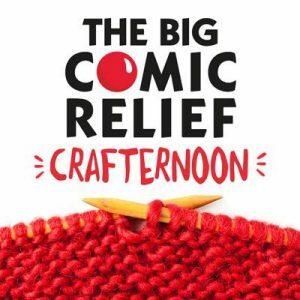 Join in the excitement, support the cause and share your makes on The Big Comic Relief Crafternoon Facebook Page or on Twitter using #crafternoon and #rednoseday. Comic Relief Red Nose Day 2015 is Friday 13th March.